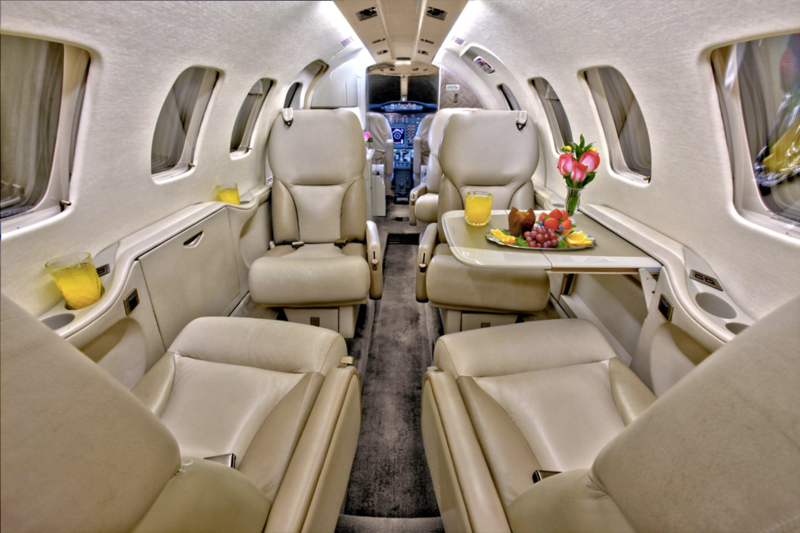 As one of the best-selling private jets, Cessna’s Citation Bravo is both fuel efficient and convenient for short range trips. 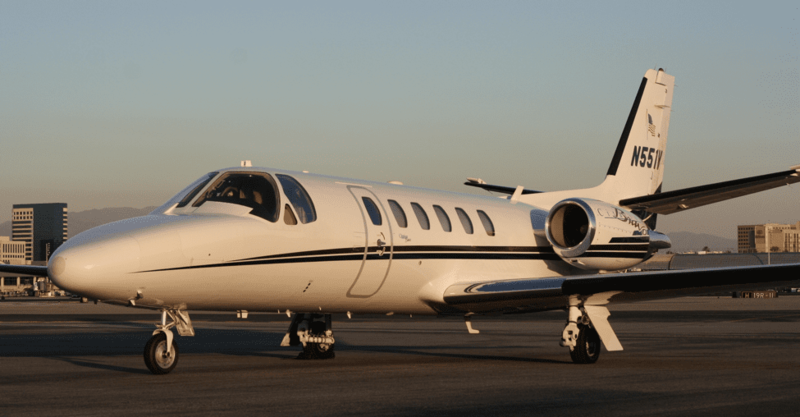 With the ability to fly into and out of a large selection of small airports, the Citation Bravo outperforms many other light jets in its category. Cabin improvements to the Citation Bravo include widened stairs as well as an additional step to make boarding the jet easier. The Bravo’s cabin seats about 8 passengers and is very comfortable. With an interior shell that eliminates the engine fan noise, cabin sound is quiet. Additionally, a secondary seal on the cabin door was added to decrease wind noise. There are several baggage compartments aboard that total a capacity of 73 cubic feet. That’s enough space for about seven suitcases, four golf bags, and a few sets of skis. There is also a convenient compartment located next to the lavatory that easily holds coats and other carry-on items. Each seat also comes equipped with its own personal storage drawer. Completing nonstop flights including New York to Miami, Los Angeles to San Francisco, and Aspen to southern California, the Citation Bravo has a longer range than most other light jets at 1,495 nautical miles. The jet also has excellent short runway capabilities, allowing accessibility to many small airports. The Citation Bravo outperforms its predecessor, the Citation II, in many ways including climb, cruise, and altitude performance. The Bravo’s increased performance is also largely due to the new Pratt & Whitney turbofan engines, which burn 13% less fuel than other engines. Improvements to the jet weren’t just made for the passengers, but the crew as well. An easier preflight as well as easier servicing and maintenance tasks decrease crew workload. A new landing gear makes taxiing on uneven pavement and landings smoother than ever before. 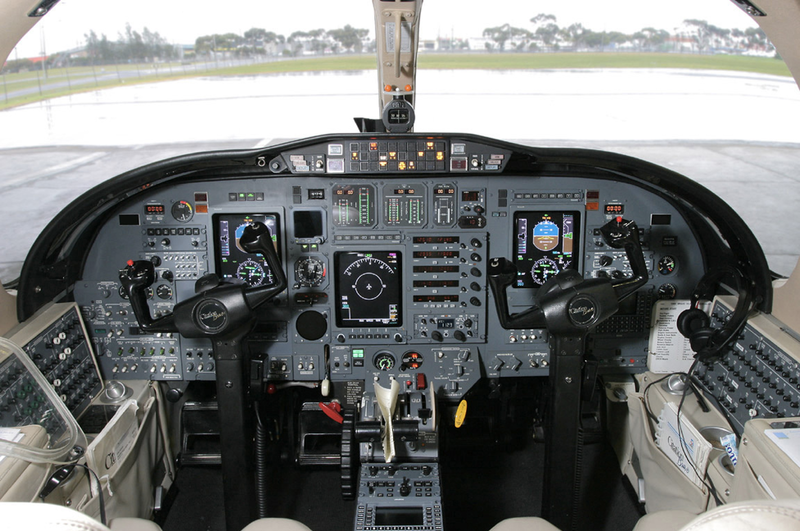 The cockpit is fitted with new systems including a weather radar, digital maps, and traffic avoidance information. Pilots love the Bravo because it is easy to fly and can even be certified to fly with a single pilot. The Citation Bravo is a favorite among the pilot and passenger community. With its seamless systems, pilots will appreciate how easy it is to fly and passengers will love the ultimate comfort and baggage space available in the cabin.